Whatever creative field you are striving to excel in – whether it be graphic design, web development, blogging, or writing of another kind – inspiration can be gleaned from any creative field, even if that field is not directly related to what you personally do. As artists striving to stand out in our own niches, it is important that we notice and appreciate ground-breaking or otherwise imaginative work done in a broad range of artistic spectrums. In this article you’ll get inspiration from the area of creative writing in popular television series episodes from the past 40+ years, and we’ll discuss how the creativity achieved in these particular episodes can motivate all of us, as artists, to always strive to prevent our creations from being too normal and predictable. The artists who wrote or co-wrote the TV Series episodes that we’re featuring here were accustomed to producing work in a familiar environment, in harmony with the shows’ usual themes and settings. But in specific instances, those writers decided to create something unique that would long be remembered and appreciated. Some of the creativity was visual, other examples were more related to adjustments in theme, and others involved a little of both. Let’s review how these particular episodes were different from what came before, and hopefully this will inspire artists today to become motivated to similarly push their work to a new level. Show Synopsis: Star Trek is one of the most famous TV series in the history of television and portrays the adventures of the U.S.S. Enterprise as commanded by Captain James T. Kirk (William Shatner) and his First Officer and best friend, Mr. Spock (Leonard Nimoy). They lead a 5-year mission, representing the United Federation of Planets, to boldly go where no man has gone before. Why This Episode Was Unique: Star Trek traditionally was heavily dependent on fictional technological elements for its plots. In this episode the writers allowed the characters to be removed from that familiar environment through a time portal that is accidentally discovered by members of the Starship Enterprise during a search for Doctor McCoy (DeForest Kelley). McCoy jumps into the time portal, initiating a series of events that causes Nazi Germany to conquer the world, which in turn prevents the U.S.S. Enterprise from ever existing. To correct the disaster, Kirk and Spock decide to enter the portal at a time period just before McCoy entered, ending up in New York City during the 1930s “Great Depression”. 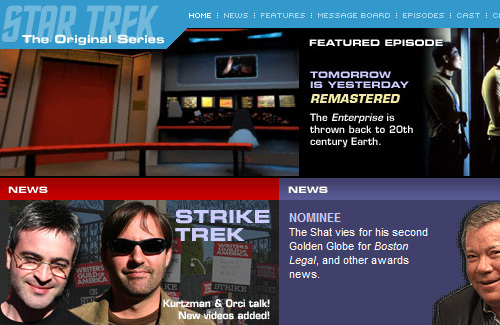 This episode may be one of the greatest stories in television series history, not only because of its dramatic portrayal of the changing of world events, but because of the Star Trek producers’ innovative idea to remove their main characters from their all-too-familiar high-tech setting and propel them daringly into one of the darkest and simplest time periods in human history. How It Inspires Creativity: Artists today tend to become dependent on a specific “brush size” or “canvas style”, incorporating the different elements of their creations into familiar and “safe” environments. By imitating the producers of this episode, artists can stray from old habits and work in fresh and original settings. Show Synopsis: This series was based on the investigations of two FBI agents, Fox Mulder (David Duchovny) and Dana Scully (Gillian Anderson). Their investigations center around attempting to solve marginalized, unsolved cases involving paranormal phenomena. 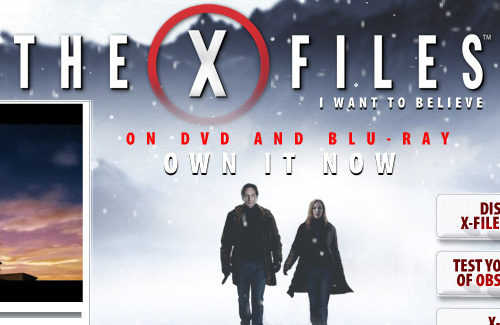 Mulder believes in aliens and the paranormal, while Scully, is skeptical and tries to debunk and control Mulder. Why This Episode Was Unique: While The X-Files was often unique and creative, in this particular episode the writers combined a different visual with a distinct musical score and an interesting plotline. The episode’s storyline references the 1818 novel Frankenstein and seems to be influenced by the 1980 film The Elephant Man, using a “carnival music” score similar to that of the film’s opening and closing credits. Also, the entire episode was shot in black and white, creating an indelible visual to nicely complement the atypical theme, which includes an investigation into the evident existence of a modern-day Frankenstein-like monster. How It Inspires Creativity: This episode of The X-Files can inspire artists to endeavor to be influenced by interesting and classic works from the past, incorporating visuals and sounds that highlight a particular theme or subject matter. 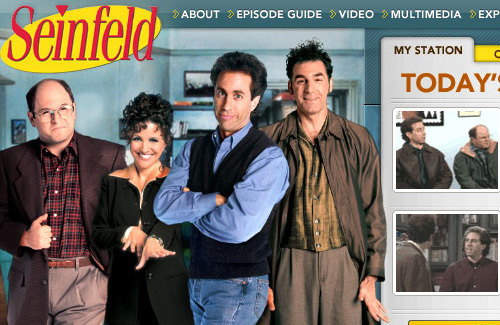 Show Synopsis: This popular American situation comedy was based on the life and relationships of the comedian Jerry Seinfeld (played by himself), incorporating many of his and co-creator Larry David’s real-life experiences into often bizarre themes. Why This Episode Was Unique: This episode, which was partly set in India, was unique for the simple reason that the entire episode, including credits and closing sequence, is shown in reverse-chronological order. It has been colloquialized as “The Backwards Episode”, and involves the use of captions to indicate the backwards nature of the plot. Each individual scene is shown in regular time, but the scenes themselves are organized in reverse order, providing a very interesting and memorable composition. Some of the story’s particulars include details that would have been quite commonplace had the episode run normally. For example, the character Cosmo Kramer (Michael Richards) is shown in different scenes with an “all-day sucker” (a candy lollipop that is very large), and in each scene the sucker gets progressively larger, indicating that time is reversed. How It Inspires Creativity: To this day, this episode stands out as something completely different from what its writers had produced prior. As artists, we too can strive to turn a theme “on its ear” (so to speak), creating something unique and different, as the writers of this episode did. Show Synopsis: Moonlighting was a comedy-drama series that starred the now-popular movie actor Bruce Willis, and featured characters David Addison (Willis) and Maddie Hayes (Cybill Shepherd) working as detectives in a big-city agency, attempting to solve various crimes. Why This Episode Was Unique: This episode, which aired in the show’s third season, has stood out as one of the most unforgettable and creative in television series history. It begins with a young boy watching an episode of the very show he’s in (Moonlighting), then being reminded by his mother that he has to read the Shakespeare play The Taming of the Shrew for school. When the boy starts reading the play, the show enters his imagination; the remainder of the episode, aside from the closing scene that again involves the boy and his mother, is an abbreviated reenactment of The Taming of the Shrew by the Moonlighting cast in full Shakespearean garb. Mixed within the 16th century theme are humorous anachronisms and other references to the show’s own modern-day influence, including a scene where Bruce Willis’s character rides in on a horse with BMW logos on its saddle blanket. Atomic Shakespeare was a stunning and original creation in a TV series that was already years ahead of its time. Moonlighting often furnished ground-breaking humour and dialogue that would influence many TV shows for years to come. This episode took the characters completely out of their element, and created an astonishing contrast with the modern city environment that the show normally portrayed. How It Inspires Creativity: As creative professionals in our own fields, we too can strive to break from the norm by placing our own “characters” in unusual and contrasting settings, striving to break ground both thematically and visually. Show Synopsis: Dawson’s Creek was a very well-written, semi-autobiographical show about the lives of four teenagers in the fictional town of Capeside, Massachusetts. The show was loosely based on the small-town childhood experiences of Kevin Williamson, the show’s creator. Why This Episode Was Unique: This episode featured an important turn of events involving the show’s main character, Dawson (James Van Der Beek). Dawson finds out that his best friend Pacey (Joshua Jackson) has started a relationship with Dawson’s long-time childhood sweetheart Joey (Katie Holmes). For such an important episode the writers chose a unique way to tell the story, borrowing from a similar style presented in the movies Groundhog Day (1993), The Usual Suspects (1994), and Go (1999), the latter of which also coincidentally co-starred Katie Holmes. The episode plays out the day’s events from 4 different perspectives, each time adding details to the story to help fit the puzzle pieces together. Each of the first 3 perspectives begins with Joey’s voice setting the tone both thematically and compositionally, when she says: “Ever have one of those days you wish you could live all over again?” And that’s exactly what the writers did with this episode, creating one of the most emotional, tension-building arrangements in recent television history. How It Inspires Creativity: Although the style presented in this episode was done a number of times before, the writers used the idea to make an already tense and memorable episode even stronger. As artists, we can similarly add originality and singularity to our creations to make a powerful work even more forceful. Show Synopsis: Family Ties was an award-winning, family-oriented dramatic sitcom that helped propel the career of Canadian actor Michael J. Fox. The show focused around the Keaton family, and addressed a number of social and domestic issues in comedic ways. Why This Episode Was Unique: This Emmy Award-winning 2-part episode featured Fox’s character Alex dealing with the death of a close friend who had died in an accident in an automobile that Alex himself was supposed to be in. Because Alex was too lazy to help his friend move a piano, Alex did not go, and so avoided dying in the car with his friend. The episode still remains vivid in the minds of those who first saw it, as the majority of it consists of Alex speaking to a psychologist to help him deal with what has happened and help Alex find his place in the world. During the conversation, the background is completely black and numerous rudimentary, prop-filled, theatre-influenced vignettes take focus in the darkness behind Alex while his life and relationships are analyzed. 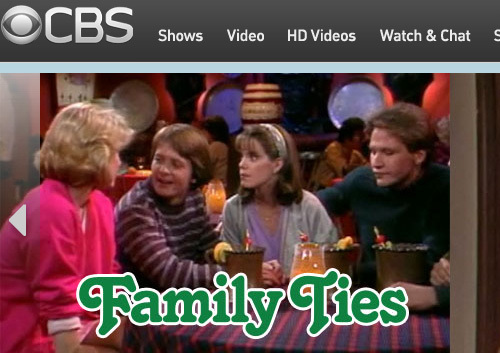 The writers and producers of Family Ties created a groundbreaking masterpiece that is still remembered as the best of all Family Ties episodes, and certainly one of the most unique presentations in the modern-day history of situation comedies. It was memorable not only because of a superb performance by Fox, but also because of its distinct and innovative setting. How It Inspires Creativity: Similar to what the writers did here, artists in a variety of creative fields can incorporate dark, melancholy, and – where appropriate – simplistic elements into their creations to help propel their work into visually stunning masterpieces that will for years be remembered and appreciated. 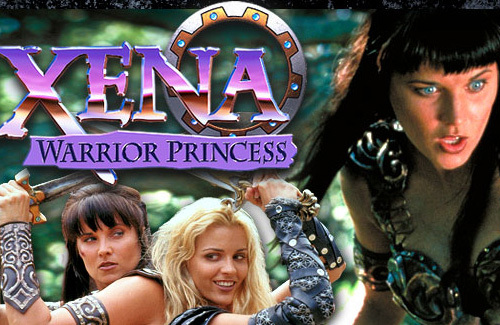 Show Synopsis: Xena: Warrior Princess was a fantasy drama series set in ancient Greece that was heavily influenced by Greek mythology. It portrayed Xena (Lucy Lawless) fighting for good against evil in her quest for redemption of her past sins as a ruthless warlord. Why This Episode Was Unique: This Emmy-nominated episode presented a huge change of style that would later be imitated by other television series including Buffy The Vampire Slayer and the comedy-drama Scrubs. Instead of having the characters do straight dialogue, the show was done as a musical and later inspired a 9-song soundtrack released by Universal Music. It is quite daring for a show’s production team to attempt a musical episode because of the potential for negative response from fans and critics. But this didn’t stop the producers of Xena from creating a distinct episode that would inspire for years to come. How It Inspires Creativity: All artists can give their creations a new voice through inventive sights and sounds, in the same way the writers of Xena did in this one-of-a-kind, often-imitated episode. Show Synopsis: Buffy The Vampire Slayer was a fantasy-drama with comedic elements that involved the main character Buffy (Sarah Michelle Gellar) fighting as a vampire slayer against the forces of darkness. Why This Episode Was Unique: In this episode, writer and show creator Joss Whedon fought back against repeated assertions from fans and critics that a crucial part of Buffy was its dialogue. He did this by producing an episode that was nearly completely lacking in dialogue. In the episode, the town of Sunnydale are put under a spell by creatures called “The Gentlemen”, leaving the characters unable to speak, or “hushed”, and in the process creating a memorable and truly original plot that later received an Emmy Award nomination. How It Inspires Creativity: Whether you cringe at or are even offended by the demonic elements portrayed in Buffy, the creativity and originality of this episode cannot be denied. Artists today can use whitespace and other “silent” elements to give their work an inventive visual flair, or to create vivid contrasts – taking advantage of the fact that, in some circumstances, “less is more”. Show Synopsis: Growing Pains was a feel-good situation comedy that revolved around the suburban lives of the various members of the Seaver family. Why This Episode Was Unique: Generally, Growing Pains episodes were quite ordinary, even in comparison to other shows, but this particular episode completely broke the show’s established mold and paid homage to the famous television series The Twilight Zone. In the episode, the Seavers’ younger son Ben (Jeremy Miller) wakes up one morning to find out he is a cast member on a show called “Meet the Seavers”, and his name is in fact Jeremy Miller. The writers performed a very daring feat with this plot, essentially breaking through “the fourth wall” – which is a show business term used to describe the unseen invisible wall where the camera crew is stationed. Although Growing Pains was not a particularly creative series, this episode diverted from that pattern and is worthy of imitation. How It Inspires Creativity: Today creative professionals can make their work exist “outside the box” on occasion, preventing their creations from becoming mundane endeavors that are soon forgotten. 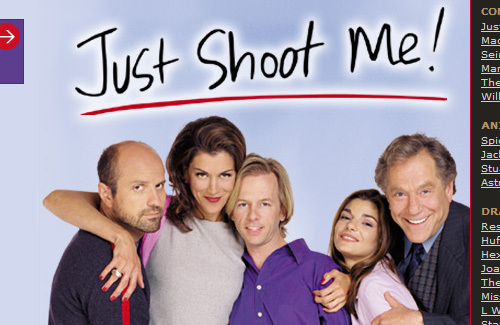 Show Synopsis: Just Shoot Me! was a situation comedy that followed the staff of a fictional big-city fashion magazine called “Blush”. Why This Episode Was Unique: In this episode, the writers diverted completely from the show’s traditional format, instead creating a sort of mock documentary parodying the real biography shows done by the A&E Network. The exposé chronicled the life of one of the show’s supporting characters, Nina Van Horn (Wendie Malick), incorporating a number of key events in American cultural history. This was an out-of-the-ordinary episode that bore little resemblance to prior episode plots, and indicated that the show’s writers were not afraid to push the boundaries of what audiences expect in modern-day situational comedies. How It Inspires Creativity: This episode required visuals and thematic elements that were very different from what the show’s audience was used to. Today, artists can avoid repetitive habits in design by incorporating elements in unusual and unexpected ways – even allowing secondary-type design elements to take focus where appropriate. There were many episodes that were not included on this list that deserved to be here. I have attempted to include a list that is diverse and allowed for discussion of a number of specific creative and inspirational elements. In each of the television series episodes discussed, it is undeniable that the writers crafted a masterpiece that can inspire artists from many different creative fields to rethink their own work – helping them to break out of normalcy by creating something unique and memorable. Please feel free to comment and include your own favourite unique television series episode – something that inspired you to strive to present your own work in a distinct and memorable way. This post was not something that you usually read on Smashing Magazine. Did you like it? Should we go beyond the “traditional” scope of web design in our future articles? It’s up to you – let us know!